In the next 3-5 years, more than 50 percent of online businesses will be offering same day delivery. This stat proves that when e-shopping, customers want the convenience of e-stores and the instant gratification brick and mortar stores offer. But, making same day deliveries is easier said than done. Far too many businesses promise to deliver on the same day but items reach customers on day two or three. Often, the reason is that they work with inefficient couriers. 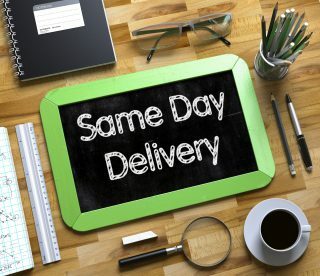 In this article, we’re telling you how same day delivery will take your business to the next level. You’re certainly wondering how making speedy deliveries will boost your bottom line, and for good reason. As far as you’re concerned, couriers charge you more to make same day deliveries. However, did you know over 61 percent of online shoppers are willing to pay more to receive their orders on the same day of purchase? The greatest mistake you can make in a business is to unjustifiably charge customers more for a product or service. But once you know they have no problem paying more, it pays to make a reasonable price increase. Sure, one can argue the price increase will carter for the shipping costs. But as you develop a stronger business relationship with your courier, you’ll likely get regular discounts. This is where you’ll make money! Same day shipping is a primary consideration for at least 18 percent of online shoppers. If they find that an online store doesn’t offer fast deliveries or isn’t clear on delivery timelines, they will abandon the shopping cart. This isn’t good news. In a fiercely competitive marketplace where giant stores like Amazon and Macy’s offer as fast as a 1-hour delivery, you can’t afford to lose a customer. Same day delivery is your best chance of maintaining and growing your customer base. If you keep your word and impress first-time customers with same day shipping, count on them to buy from you again. They’ll even refer you to their family and friends. And as you probably know, word-of-mouth marketing is king. Yes, word-of-mouth marketing is king, but as much as 84 percent of people also trust online reviews just as much as they trust recommendations from friends. For any business, particularly an online business, positive reviews are key to your survival and success. The vast majority of online customers typically research the online reputation of a company before doing business with it. One of the most effective ways to earn a solid reputation is to have excellent online reviews. How do you get these reviews? Although you have little control over what customers say about your business online, you have complete control over the quality of customer services you offer. Offering same day delivery will help you improve customer experience. The happier and more satisfied your customers are, the more they will hop on popular review sites and give your business a mark of approval. With lots of positive reviews, potential customers will develop a strong urge to buy from you. Even beyond sales, the social media buzz around your business will increase. This will give your search engine optimization efforts a boost. Search engines, especially Google, tend to give brands with a positive social media buzz a higher ranking. Warehousing is central to the success of an online business. You need warehouses to store your products after manufacturing up until they’re finally shipped to the customer. If your business ships nationwide, you need warehouses across the country. When your products are not fast-moving, you’re bound to incur a lot in warehousing costs. Providers of warehousing services will keep charging you for any merchandise that sits in their facilities. Enter same day delivery and products start to fly off. What’s the net effect? Your merchandise spends less time in a warehouse, so you pay less. In fact, when business improves as a result of fast shipping, it’s possible to ship products straight from your manufacturing or assembly facilities. You can use the cash your cut from warehousing costs to improve other aspects of your business, like hiring more workers. Are your employees motivated or is their morale low? Want to turbocharge their performance? Offer same day shipping! Orders will increase and products will start flying off the stores. This means you’ll need to manufacture or acquire more stock, so your employees will need to step up. Psychologically, fast moving goods is a sign your business is doing well. Employees will feel motivated to put in the hard work, because a bonus or pay rise may be happening soon. The sum effect of the points described above is you will have a competitive advantage in your local digital marketplace. Think of the many manufacturers, department stores and other businesses that are trying to dominate your local e-commerce market. Don’t wait to offer same day delivery in the next 3-5 years. Do it now. By the time other businesses are catching in on the trend, you’ll be well over the horizon. The era of instant gratification is here. As an online business, you either embrace the era or watch your business go bust. It doesn’t have to get there. Offer same day delivery and watch your business grow threefold or more. However, your same day delivery promise is only as good as the courier you choose to work with. At ASAP Courier we’re all about helping you stay true to your word — we offer same day, national shipping. Whether you’re a small business or a large retailer, we’re looking forward to being your logistics partner. If you’ve any questions, we’re only a phone call or email away.